One of main questions which interests potential clients is what will be workload, timeframe and costs for their project. However we are sure, that proposal of high quality should contain much more information. In Haritha Technologies we perform comprehensive analysis of client’s input information and provide detailed feedback which includes such points as identification of resources involved, project plan, costs and discounts, execution methodology and quality control approach and so on. Different clients provide different input information or RFP (Request for Proposal). 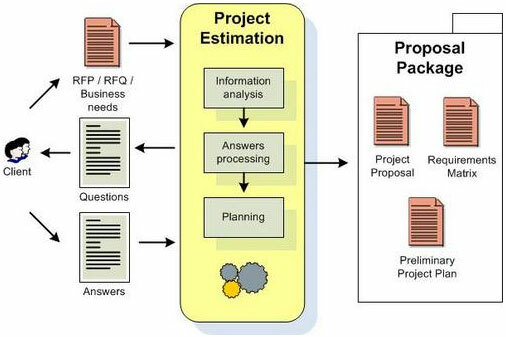 Of course, in terms of our efforts for RFP processing and in terms of accuracy of estimation, the more details the RFP contains the better. However there is no problem for us to start estimation just with some description of your needs, then in Q&A sessions we will define other required points. We analyze information provided by potential client (RFP/Business needs analysis), define unclear points for us and prepare a document with questions. Client answers the questions. We analyze answers, correct our preliminary estimations, maybe define new questions. Requirements Matrix – a sheet which shows project requirements structured via hierarchy. This document is a basis for further planning and costs drop down. If you need any additional information, please do not hesitate to contact us.